We had to be in Boston on Monday and on the way back to NYC, I suggested we plan to stop at Clinton Corners in CT. There’s a discount Le Creuset store there and that’s pretty much heaven to me! I bought a new skillet and even new orange (my favorite color) hot pads. I’m telling you, I’m so happy, I feel like I have a whole new kitchen. It doesn’t take a whole lot to get me excited. I’m a cheap date. Le Creuset is one of my favorite cookware manufacturers. I have a huge covered French oven that I just adore. Food cooked in it actually tastes better! It’s enamel coated cast iron and very easy to clean. The one drawback is that it is very heavy. But hey, it’s building the biceps! I once cooked a huge party size serving of meatballs and had to split the recipe. Half of them simmered in my Le Creuset and the other half simmered in a copper bottomed stainless steel stew pot. 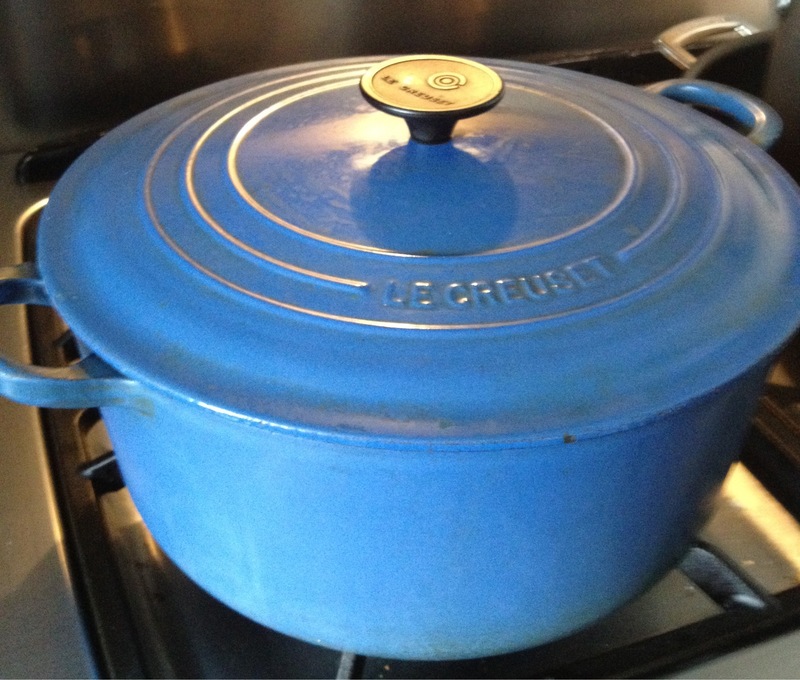 (my mother’s from the ‘60’s) The Le Creuset pot was infinitely better!! Really. The meatballs and tomato sauce had deeper, richer flavors. It’s true and I’m not even paid to say this! I think the cast iron distributes the heat more evenly and this pot with the enamel coating locks in the moisture to create super tender morsels of meat and incredibly flavorful vegetables. It’s perfect for beef bourguignon, chilis and stews of any kind. Now Le Creuset has come out with an industrial strength non-stick coated 3-ply stainless steel line and that’s the skillet I just bought. It’s lighter with deep sides and fantastic! I cut my tendon in my left hand some years ago while cutting ribs (don’t ask) and while I totally regained the bendability of my middle finger, I never really regained the strength in that hand, so lighter is better. Once again the heat distribution and browning capabilities are terrific! Check out that zucchini in the photo. If you have a favorite skillet or cookware line, please tell me about it. I’ve tried pretty much every brand there is. My favorite is All-Clad, but I didn’t know Le Creuset had non-cast-iron skillets. I too, am obsessed with all things LC, so I may have to try one out! This stainless steel non-stick line is relatively new. The saleslady said she complained to manufacturing that she was tired of people leaving the store to buy Calphalon and All-Clad so they came up with this new line. 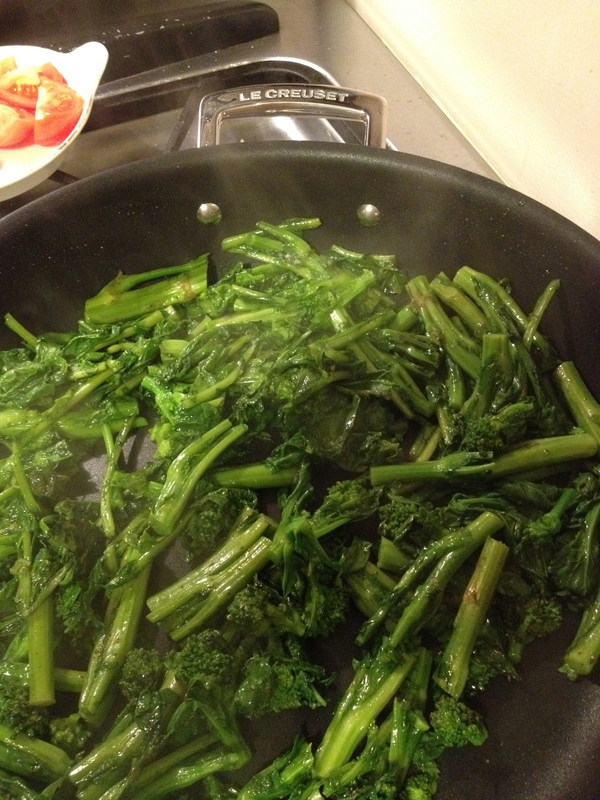 And, she said you can even use metal utensils on it – although I haven’t yet. I do love it though and have used every night since I bought it!